The San Diego Book Discussion Group is led by Fearless Leader Christine. Readers will discuss Mike Resnick’s weird western, The Buntline special. Participation is open to all readers; readers need not have completed a particular book to attend – it’s the perfect opportunity for readers to branch out and find new favorites! Book club members receive 20% off of the current book club selection! Tanya Huff reads from Blood Lines. ; Brian Keene reads from The Rising. ; Patrick Rothfuss reads from The Name of the Wind. ; Mike Resnick reads from Santiago: A Myth of the Far Future. ; Elizabeth Vaughan reads from Warprize. ; Gary Frank reads from Forever Will You Suffer. Mike Resnick's book Dark Faith: Invocations was available from LibraryThing Early Reviewers. 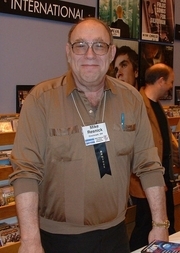 Mike Resnick is currently considered a "single author." If one or more works are by a distinct, homonymous authors, go ahead and split the author. Mike Resnick is composed of 23 names. You can examine and separate out names.